Republican presidential candidate Donald Trump campaigned in Scranton, Pa., earlier this year. SCRANTON, Pa. — The start Monday of the 2016 back-to-back nominating conventions brings with it a notable first: Never in modern presidential politics has a party’s chosen candidate been so unpopular as Hillary Clinton — except for Donald Trump, who has generally gotten even worse marks in the polls. Voters are unhappier with their presidential choices than they’ve been in two decades, polling by the Pew Research Center shows. Only 43 percent of Democrats and Democratic-leaning independents say they are satisfied with the candidate, while only 40 percent of Republicans and Republican-leaning voters are happy. The unusually troubled landscape challenges both major party candidates and, if this distaste persists, could inject a larger-than-usual dose of uncertainty into the election. While some voters appear ready to hold their noses and vote for whoever they see as the least objectionable option, others are saying they’re torn or plan to just sit out this election altogether. Pew found that about four in 10 voters are having a hard time picking between Clinton and Trump because they say neither would make a good president. Meanwhile, an overwhelming majority of Americans, 81 percent, say they would feel afraid if one of these two mainstream candidates were elected, according to an AP-GfK poll released last week. A quarter of those surveyed said they were frightened by the prospect of either Trump or Clinton winning the White House, according to the Associated Press. This is not a picture of a happy electorate. Voters in Scranton, a somewhat scruffy but politically commanding Rust Belt post, are among those feeling the malaise. Pennsylvania is a key battleground state, and it’s places like Scranton and its surrounds — areas full of blue-collar workers whose fortunes never bounced back from the loss of manufacturing jobs — that provide the clearest path to Trump’s taking the White House, and therefore are where the Clinton campaign must fight to block any GOP gains. “Hillary is OK,” he continued, but Donovan, who works in manufacturing, doesn’t feel as though the former secretary of state understands the worries of a guy like him. She took millions in campaign contributions from Wall Street, so she’s not going to pick on them, he said. A few tables away, Jim Burke, who recently retired from teaching at Lackawanna College here, said that for the first time in his life he isn’t planning to vote. “It’s an awful way to feel as an American citizen,” he said. A Sanders supporter in the primary, Burke said he wished House Speaker Paul Ryan, a Republican from Wisconsin, were running for president. That would lead him to vote Republican for the first time in his life. “I’ve lost faith,” he said. 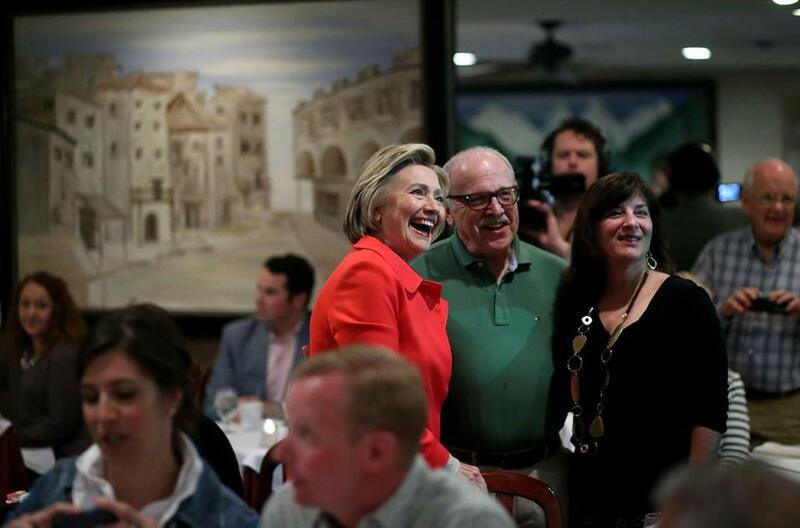 The Pew survey results show that Hillary Clinton, shown at a Scranton restaurant in April, is approved of by just 43 percent of Democrats and Democratic-leaning independents. The Republican and Democratic national conventions offer one opportunity for the parties to chip away at the antipathy, starting with the Republican convention, which kicks off Monday afternoon in Cleveland. Typically, conventions serve to “remind partisans what they like about their party,” as opposed to the particular candidate, by celebrating past victories and common enemies, said David Peterson, a political scientist at Iowa State University. Peterson, though, isn’t so sure the Republican convention will inspire much party loyalty, given Trump’s penchant to focus on and celebrate Trump. The decision by scores of major party figures to skip the event won’t help disgruntled Republicans warm up to Trump, either. Both former presidents Bush and almost every other living GOP presidential nominee have RSVP’d no. The unity bid is looking better for Clinton. A preliminary speaker list sent out by the Democratic National Committee Friday shows a program studded with political stars far more popular than the former secretary of state, including President Obama, who is enjoying notably high approval ratings. Working against both Trump and Clinton, though, is the fact they are so incredibly well known, Peterson said. That somewhat unusual situation makes it harder for either campaign to change the narrative about its candidate. What all of this will mean in November remains unclear. On the one hand, continuing disgust could lead more voters to stay home, or perhaps to choose one of the third-party candidates: the Green Party’s Jill Stein or Libertarian Party candidate Gary Johnson. Some analysts believe all these strong feelings, even though they’re negative, could translate into more voting, not less. Pew data going back to 1992 suggest that voters can turn out even if they really don’t like the candidates, so long as polls show Americans are interested in the election, William Galston, a scholar at the Brookings Institute, a Washington think tank, wrote recently. The Pew survey found that 80 percent of voters have thought “quite a lot” about this election, and 85 percent said they are following news about the candidates fairly or very closely. Both responses are at their highest level at this point in any campaign since 1992. For now, it seems that unhappiness and uncertainty rule the day. “It’s hard for me to really get behind either candidate. I struggle,” said Patrick Sandone, founder and president of Scranton-based Net Driven, which provides automated online marketing services to the auto industry. He was a big Sanders supporter. Clinton and Trump both feel like more of the same old politics, Sandstone said. He doesn’t believe either is really fighting for what attracted him to Sanders: the Vermont independent’s crusade to return the country to a place where one person’s vote counts just as much as the next person’s, he said. 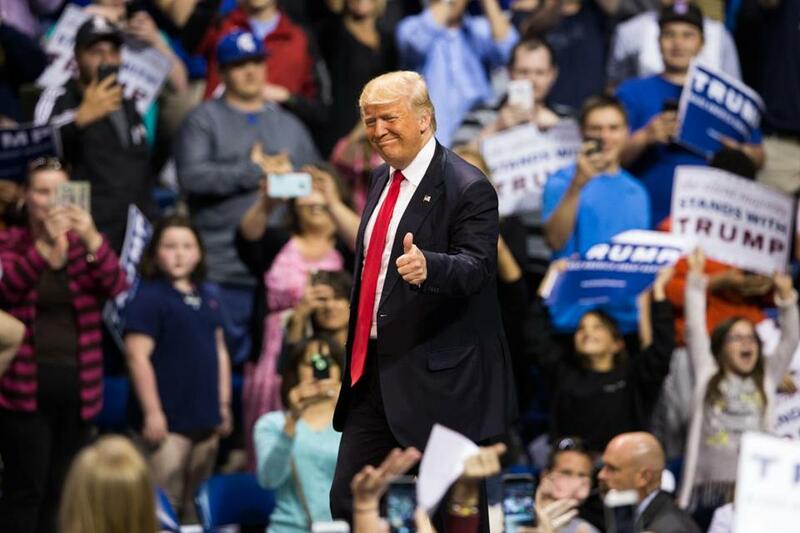 A whopping 54 percent of Pennsylvania voters said they had a “strongly unfavorable” view of Clinton, and 50 percent said the same of Trump, according to Quinnipiac polling released last week. The candidates inspire similar levels of disdain in Florida and Ohio, two other crucial and vote-heavy swing states, the poll showed. And close to 60 percent of voters said they’re unhappy with the choice between Trump and Clinton, according to a ABC News/Washington Post poll released Sunday. Among those backing Clinton, 54 percent said they’re mainly casting a vote against Trump. As for Trump supporters, 57 percent said they’re mostly voting in opposition to Clinton. Mary Tellie, a registered Republican who owns a coffee roasting business in Scranton, Electric City Roasting, hasn’t seen enough from Trump or Clinton when it comes to solutions to help the struggling middle class — more specifically, her customers and workers. Instead, the campaign season has focused on the trivial, she said.